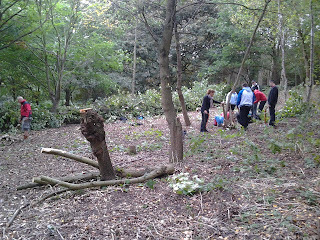 On Saturday 29th October we are holding a consultation and workday event at the RSPB Woodland. This will be an opportunity to see and discuss the work taking place on this 22 year old plantation. 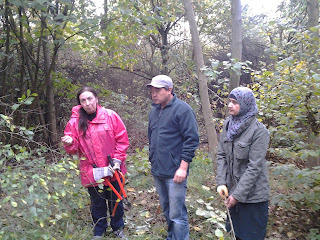 So far we have had work parties from Bournville College and the Bridge Centre to coppice an area of woodland consisting mainly of Oak, Hazel and Blackthorn in a practice that will see a rejuvenation of the ground vegetation in spring-summer 2012. Volunteers will receive training in tool use, health and safety and woodland management procedures and will be able to discuss plans for the rest of the plantation. Wear clothes and if you have any bring gloves and a packed lunch, I will bring the storm kettle to make tea. 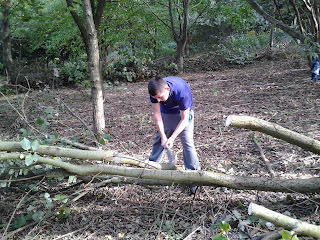 During the past week two groups and a work experience student have been busy with the Rangers at the RSPB plantation, one of the groups from HSBC and one from the Bridge Centre in Moseley, both of whom will be there again this Thursday. Work has begun at the top of the site, cutting back overgrown laurel and blackthorn and also along Spencer's hedge and more coppicing work continued to provide dead hedge habitat and a variety of other products. These photos show the current barrenness of the woodland floor, no ground cover at all, and this will change next spring as increased light levels encourage new ground growth. This particular willow shaded out a large part of the area. The willow has been pollarded rather than coppiced, thus adding a mid layer of new growth also to be revealed next spring.